Kirton's Andrew McGuire slides in against Lewis Gray of Pointon. Railway Athletic continue to cause upsets in the cup competitions. After dispatching of Pinchbeck United in the Lincolnshire Junior Cup, the Division Two pacesetters defeated Premier outfit Billinghay Athletic on their own patch in the Sharman Burgess Sports Cup on Saturday. Third division FC Hammers edged out first division side Woodhall Spa United 4-3, with goals thanks to Reece Snade (two)2, Kristian Taylor and Zak Mitchell. Friskney and Freiston were also involved in an exciting seven goal encounter with Victor Sibert scoring twice to help Friskney through to the next round following a 4-3 home win. Jeremy Brown and Greg Brown were also on target for the home side. Freiston went close with goals from Perrie Dale, who scored twice and Tom Deamer. Freiston’s cause wasn’t helped with the dismissal of Tom Bates just before half-time. Old Leake had a routine 3-0 home win against Fosdyke with Curtis Revell being instrumental in the two of the goals. The striker opened the scoring on the half hour mark before Scott Mackay added a second just before the break. Revell was then brought down in the penalty area in the second half and Scott Mackay tucked away the spot-kick to make it 3-0. The Fosdyke goalkeeper produced some fine saves to keep his side in the game during the tie but, in general, the encounter was a mundane one. Two goals from Sam Jackson helped Ruskington Rovers squeeze through by the odd goal in five in their home tie against Benington. Matthew Robinson hit the other Ruskington goal in a 3-2 home win. FC Kirton put up a brave fight in their home tie against Premier Division side Skegness Town Reserves before going out following a 2-1 defeat. Josh Whittam and Michael Parnham grabbed the Skegness goals. It was the same outcome for another of The Division Two sides when Eastern European FC went down by the same score-line of 2-1 when first division FC Wrangle battled through. Daniel Angher and Kyle Holland hit the Wrangle goals. There were two double figure score-lines as both Coningsby and Wyberton struck 11 goals away from home. Coningsby were probably expecting a tougher task away at Sibsey but they found themselves 5-1 in front at half-time and they didn’t let up after the break netting another six. Wyberton Reserves also hit 11 at Sutterton with Liam Shinn helping himself to five of the goals while strike partner Shane Brackenbury grabbed a hat-trick. Reece Beauchamp, Jonny Butler and an own goal completed the scoring. Boston Titans put up a tremendous fight at Division One title-chasers Boston College before bowing out 6-4. The Third Division side belied their current position in the lower reaches with a spirited display and were rewarded with goals from Matt Howden (two), Ben Charlton and Mike McPhail. Leverton came from behind not once, but twice, as Park United made the first division side work for their victory. Two defensive errors either side of Nathan Rippin’s strike saw Park edge in front on two occasions before Joe Wood scored his first to level the scores at the break. Leverton showed more urgency after the break after the introduction of the lively Alex Lote and they went ahead when Bobby Smith’s superb curling cross was acrobatically fired home by Wood. Nathan Hubbert sealed the victory when he made it 4-2 from an impossible angle. There was only one game in the Taylors Peugeot Division One, but it provided plenty of goals in an exciting affair as Old Doningtonians came out on top at Swineshead Reserves. Ex-Swineshead striker Chris Wing did his old team-mates no favours by scoring two of the Dons’ goals in a 4-3 away win. Andy Slaughter and Ricky Mason were also on target for the visitors. Unfortunately, FC Magnet submitted an application to withdraw their team from Division One and this was approved by the management committee last week. In the Taylors Ford Division Two, Fishtoft Reserves and Billinghay Athletic Reserves shared the points following their 2-2 draw. Joe Taylor and Jack Cridland were on target for Fishtoft. Kirton Town Reserves were left wondering how on Earth they failed to gain some sort of reward from their home game against Pointon Reserves following a disappointing 3-2 defeat at Graves Park. Although striker Andy Brown did get on the score-sheet, several chances went begging as Kirton lived to regret those missed chances. Richard Borrill was the other Town scorer. In the Taylors Vauxhall Division Three, a Kieran Gatenby goal helped Benington Reserves to salvage a point in their 1-1 home draw against Pointon A.
Jake Smith struck both goals for Spilsby Town in their 2-1 home win against Leverton. Spalding Harriers surprisingly conceded six goals for the second week running when Wyberton A recorded a 6-3 home win. Jason Allen (two), Ollie Walker, McKenzie Smith, Pete Lovelace and Jack Reeson made sure of the three points for the home side. Old Doningtonians Reserves endured a real nightmare of a second half when they were humiliated 6-1 at home by Friskney Reserves. Amazingly the Dons held the lead at half-time but then collapsed after the break. Their only consolation came in the form of a Josh Nicol strike. 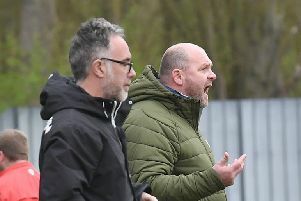 The Boston Saturday League were dealt a further blow when FC Boston decided to call it a day and the Management Committee accepted their application to withdraw their side from Division Three.